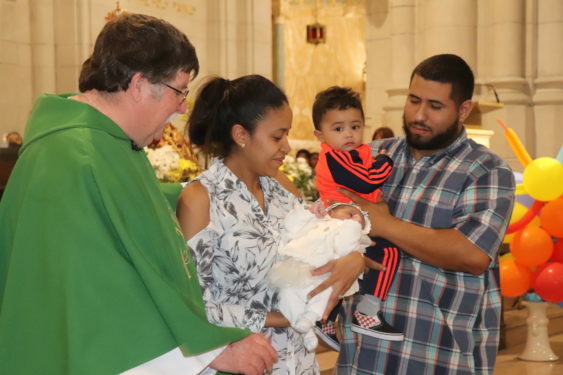 Sleepy-eyed babies, little girls with white veils, Boy Scouts, Jornadistas and children of all ages came for a special Mass and celebration in honor of International Children’s Day at the Basilica of Our Lady of Perpetual Help in Sunset Park. The lecterns were adorned with balloons and the children’s choir sang and clapped happily for the Mass that was part of the Redemptorists’ Basilica’s 125th anniversary celebration. He invited the youngest member of the congregation, newborn Gianna, to the altar for a special blessing. He spoke of how much joy the baby has brought to the rectory through her grandma, Sergia, who works for the parish. 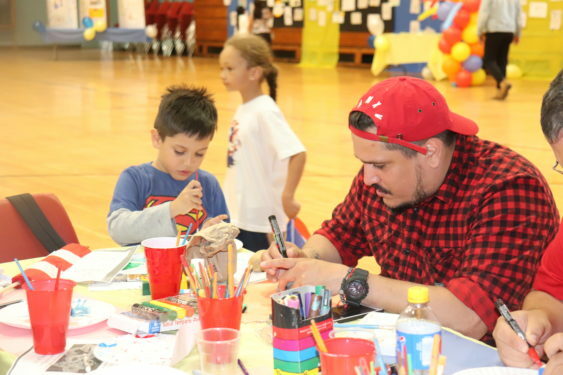 He told the other children that their birth also brought immeasurable happiness into the world. 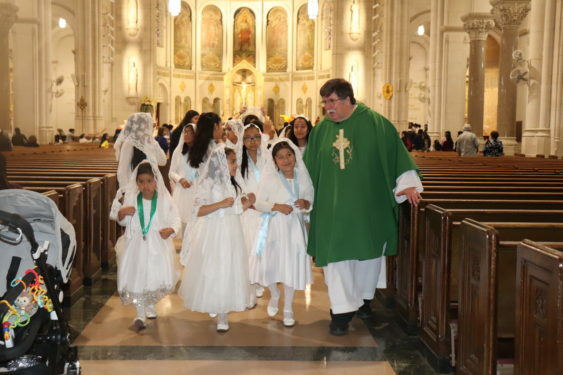 Yisleyry Claros Silva, 9, shared her joy in the Lord as the cantor for the Mass. She said it was a bit scary, but her nerves were quelled because she knew Who she was doing it for. “We do it for the Lord,” she said. Her mother, Briceida Silva de Claros, said she is happy to support her daughter, who asked to join the choir two years ago. It allows the girl to get to know God better, she said. Monserrat Hernandez, 9, also asked to join the choir when she saw her cousin sing. She doesn’t really have anything else to do on Friday evenings, she said, and this way she gets to spend time with her friends. “I like to talk to God and sing His Word,” she said. It was through the children’s own initiative that the choir came to life six years ago, said Judy Fernandez, choir director. A little boy with a toy guitar started playing and singing around her in church and other children soon joined in. Now the choir sings at the front of the church during the first weekend of every month and practices every Friday. Another popular children’s group in the parish is the Daughters of Mary. 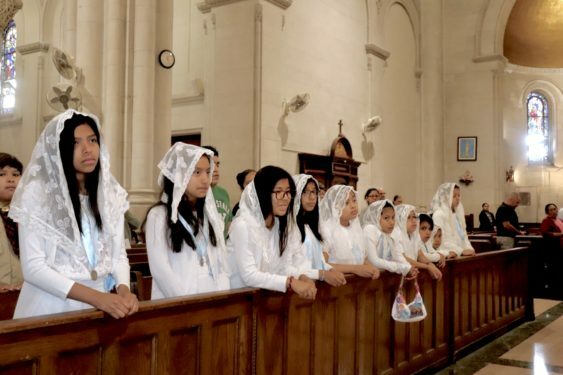 Once a month, the girls come to Mass dressed in white dresses with white veils. After Mass they pray the rosary together and do an educational activity. It’s a sacrifice for the girls and the parent who accompanies them, but Olga Lopez, mother of Genesis Lopez, said it is well worth it. She said the group prepares her daughter to be an active adult in the church and to get closer to God. She said she is also happy to support her daughter, who then in turn supports her in the adult prayer group Jesus and Maria. Although these practices require a significant sacrifice of time for the family, Olga said it is certainly better than staying at home and watching television. The practice has also been a saving grace for the family. Olga said she is blessed to speak with the priests at the church and to Our Father, God. One year ago, Olga lost her baby boy two days after birth. The pain, she said, is still very real and with her constantly, but she has been able to accept the loss as God’s will. The death was devastating for the family, she said, but they did not have to face it alone. “I grabbed onto the hand of God,” she said.